For the registration formular click here. Every participant has to fill out a separate form. Please print your completed registration form and return it by Email, regular mail or fax. Cost include tuition, six nights hotel accommodation, lunches, refreshments, study materials and excursions. A non-refundable partial payment of 600,- Euro via Pay Pal or Bank Transfer will be due at the time of registration. The remainder will be due at the beginning of the course on the first day or you may choose submit payment, in full with your registration. Registration will not be possible after June 15th 2015. Number of participants: minimun 10 to maximum 20. In the design professions the aspect of colour is often considered secondary to the making of form. In reality however, colour is experienced via the materials that make up the surfaces of objects and spaces, and therefore is an integral part of any experience. This workshop will consider the integration of colour, light and material into design from the beginning of the creative process. During an inspiring week of workshops, lectures and excursions to Dresdens’museums and surrounding Elbe Valley landscape we will progress from an initial intuitive familiarization with colour through quantitative and qualitative analysis, the making of colours and colour collections to a systematic understanding of the use of colour and its scientific foundations. Participants will apply their acquired knowledge in individual and group projects. 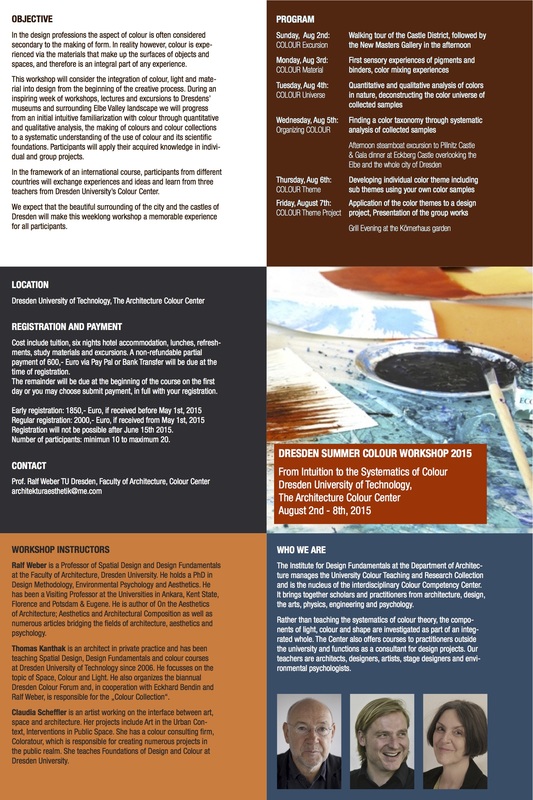 In the framework of an international course, participants from different countries will exchange experiences and ideas and learn from three teachers from Dresden University’s Colour Center. We expect that the beautiful surrounding of the city and the castles of Dresden will make this weeklong workshop a memorable experience for all participants. The Institute for Design Fundamentals at the Department of Architecture manages the University Colour Teaching and Research Collection and is the nucleus of the interdisciplinary Colour Competency Center. It brings together scholars and practitioners from architecture, design, the arts, physics, engineering and psychology. Rather than teaching the systematics of colour theory, the components of light, colour and shape are investigated as part of an integrated whole. The Center also offers courses to practitioners outside the university and functions as a consultant for design projects. Our teachers are architects, designers, artists, stage designers and environmental psychologists. Ralf Weber is a Professor of Spatial Design and Design Fundamentals at the Faculty of Architecture, Dresden University. He holds a PhD in Design Methodology, Environmental Psychology and Aesthetics. He has been a Visiting Professor at the Universities in Ankara, Kent State, Florence and Potsdam & Eugene. He is author of On the Aesthetics of Architecture; Aesthetics and Architectural Composition as well as numerous articles bridging the fields of architecture, aesthetics and psychology. Thomas Kanthak is an architect in private practice and has been teaching Spatial Design, Design Fundamentals and colour courses at Dresden University of Technology since 2006. He focusses on the topic of Space, Colour and Light. He also organizes the biannual Dresden Colour Forum and, in cooperation with Eckhard Bendin and Ralf Weber, is responsible for the „Colour Collection“. Claudia Scheffler is an artist working on the interface between art, space and architecture. Her projects include Art in the Urban Context, Interventions in Public Space. She has a colour consulting firm, Coloratour, which is responsible for creating numerous projects in the public realm. 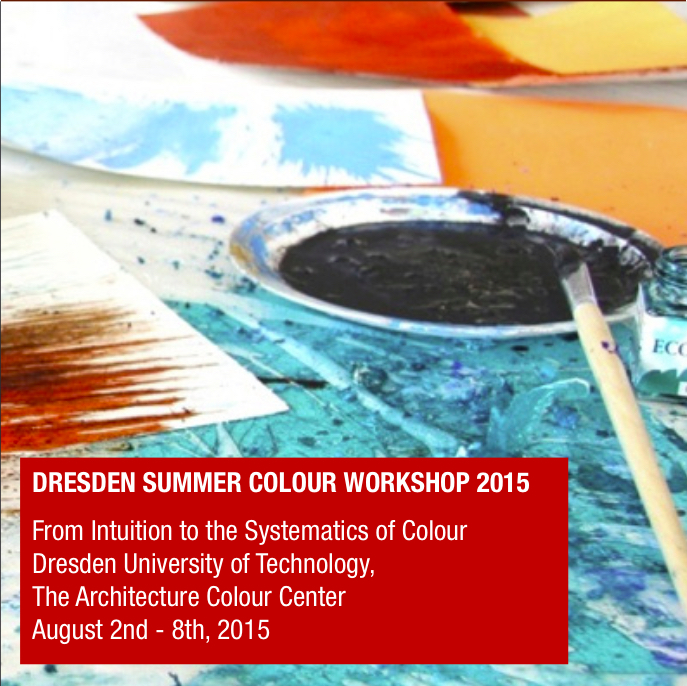 She teaches Foundations of Design and Colour at Dresden University.